The strategical placement of the Duplex design on the JPX Z8-CX frame is further strengthened by the introduction of Zylon reinforcement over the frame. The addition of the Carbon Handle design and Xtra Slim shaft which moves the flex point closer to the frame into the radical JPX Z8-CX frame results in more powerfully controlled & pinpoint accurate shots. 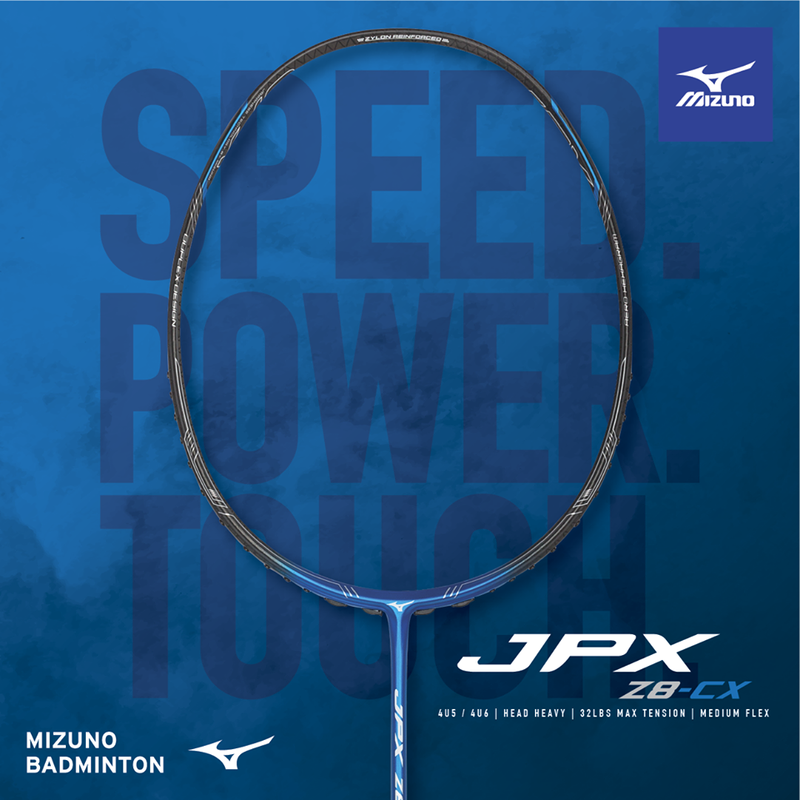 Made for players who demand speed, control and now touch without compromising power. 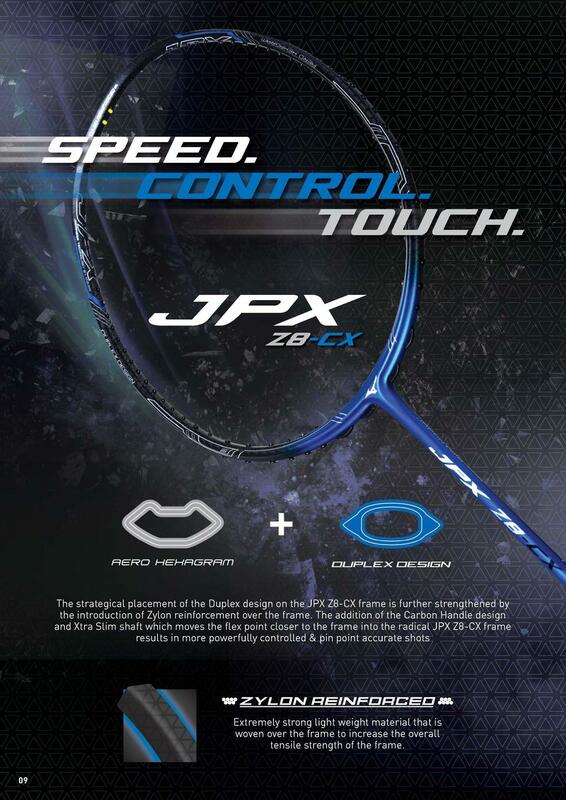 Mizuno JPX Z8-CX having a Medium Flex, and 3D Graphite Endcap. Combining the structural strength of a Box Frame and the Aerodynamics of the Aero Hexagram frame, the Duplex Design is able to absorb an extremely high level of pressure without compromising the racquet head speed during the stroke play. The six-pointed 'star' like a frame with equilateral angles reduces air resistance and the lower frame's high-level strength increases repulsion power. The aerodynamic frame is perfect for lightning fast shots and high-speed rallies. The graphite sheets heated at a higher temperature to further eliminate the impurities during the initial manufacturing process. 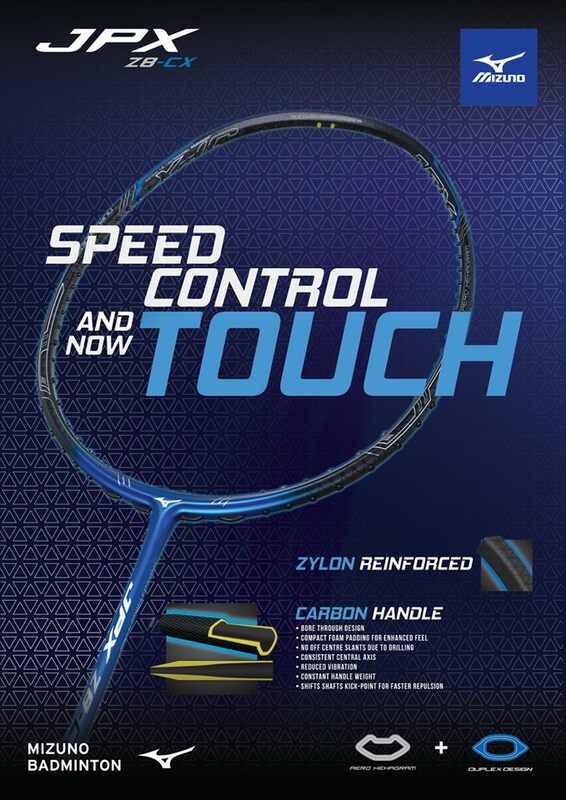 This results in a smoother more consistent coating that not only strengthens the frame but enhances the aerodynamics of the graphite thus increasing the racquet's velocity. The shaft is constructed using 'Nano PEF' (Nano Polyethylene Fibre) which is light enough to float on water yet able to withstand immense forces. The characteristics allow for maximum shock absorption. Extremely strong lightweight material that is woven over the frame to increase the overall tensile strength of the frame. A revolutionary Bore through handle design allows the central core’s axis to remain consistent, removing the off centre slants faced with traditional drilling in wooden handles. The compact foam backed padding diminishes vibration, removes the inconsistency of weight in wooden handles, yet does not compromise the feel factor. The density of the Carbon handles reduces the torque and shifts the kick point further from the shaft allowing for better control and faster repulsion.